Nathans & Biddle LLP is a litigation firm composed of elite trial and appellate lawyers devoted to criminal defense. Founded by Larry Allen Nathans, who was recognized by Best Lawyers® as the Best Criminal Defense Attorney for Maryland in 2015, our team has 85 years of combined trial experience. The attorneys at our firm provide skilled, uncompromising representation in all phases of federal and state white collar grand jury investigations, felony and misdemeanor trials, federal sentencing, criminal appeals, post-conviction litigation, federal forfeiture and asset recovery, and administrative or regulatory proceedings, including defense of lawyers regarding allegations of professional wrongdoing. The diversity of our clientele reflects the breadth and quality of our attorneys' experience. We regularly represent corporations, senior executives, politicians, attorneys, physicians, and other professionals in white collar and federal investigations. Driven by a sense of commitment and loyalty to our clients, we often excel at achieving early victories outside the public eye. Our defense attorneys are ready to help you. Call us at (410) 783-0272 today to get started. Our Baltimore attorneys have a legacy of positive results and are leaders in the legal community. To benefit from our service, call a lawyer at Nathans & Biddle LLP, and schedule a confidential consultation. Members of our firm have held many leadership positions, including former Chair of the American Bar Association White Collar Subcommittee on Federal Sentencing, & the American Bar Association Subcommittee on Forfeiture. 85 years of combined experience and insights into complex federal and white collar criminal defense. Larry Allen Nathans was recognized by Best Lawyers® as the Best Criminal Defense Attorney for Maryland in 2015 & Best Lawyers in America® for 2008-2019. View some of the victories the attorneys at Nathans & Biddle LLP have achieved for our clients. We proudly help clients in a wide variety of federal, white collar, and other criminal cases. Our attorneys have helped thousands of criminally accused clients throughout our 85 years. Nathans & Biddle LLP You are an incredible lawyer, a good man and I consider you a friend. Nathans & Biddle LLP I am privileged to have gotten to know you and blessed to have you come into my life when you did. Nathans & Biddle LLP We are acutely aware that the outcome could have been very dire without your good work. Nathans & Biddle LLP I just want to thank you for being my friend. Nathans & Biddle LLP You were a very good friend and colleague. Put our team on your side when it matters the most. Call Nathans & Biddle LLP today at (410) 783-0272 or fill out our secure online form to get started. 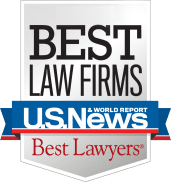 Nathans & Biddle, LLP, has received a Top Tier 1 rating by U.S. News (2008-2019) as one of the premier Criminal Defense law firms in Maryland. Larry Nathans was selected by his peers for inclusion in the Best Lawyers in America for 2008-2019. Larry Nathans and Robert Biddle were chosen for inclusion in the Maryland Super Lawyers for 2008-2019 in the area of White Collar Criminal Defense. Booth Ripke was selected for 2016-2018 in the area of Criminal Law. For over 20 years in a row Martindale Hubbell has given Larry Nathans and Robert Biddle its highest AV rating. Maryland legal publication the Daily Record presented Larry Nathans with the 2002 Leadership in Law Award. Larry Nathans (2003) and Booth Ripke (2007) received the honor of being elected as Fellows of the Maryland Bar Foundation, which is reserved for only 1% of the members of the state bar association.